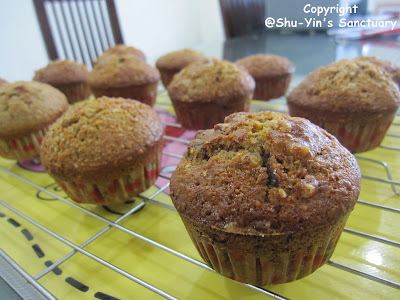 This week's Bake Of The Week is Orange Date Muffins using Whole Wheat Flour. These muffins make a hearty, wholesome breakfast because of the richness of the ingredients used. First of all, this recipe uses whole wheat flour, which still contains its bran (fiber) and its germ (rich in oil, protein, iron and vitamins). Next, it uses buttermilk and a little melted butter, which gives these muffins their rich and tender crumb. The finishing touch to this recipe is to add in dates and walnuts. Although this recipe calls for a long list of ingredients, it is easy to make. As usual, just need two bowls. One for the dry ingredients and the other for the wet ingredients. Combine them together, and hey voila, you got yourself a delicious muffin batter. 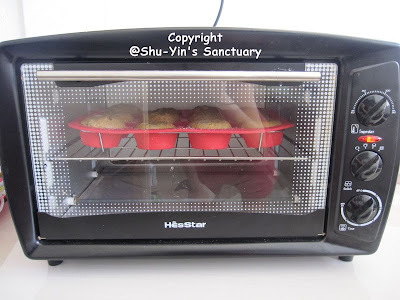 Muffins baking in my portable oven. Baking time is only around 25 minutes. 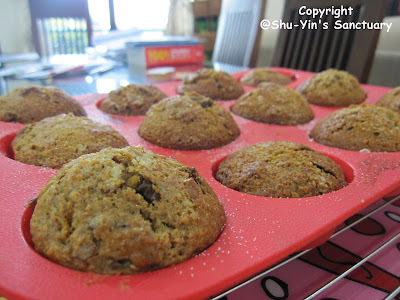 Because of wheat flour being used, the rise of these muffins are less, thus calling for a higher dose of baking powder. So what are the end results? Crispy on the outside and very tender and moist on the inside. I'm looking forward to tomorrow's breakfast. Served with a cup of milk or juice and I've got myself a wholesome breakfast. p/s - someone asked me for recipes of my bakes. I don't publish them online because I don't want my blog to end up being the recipe blog. But those of you interested, can drop me an email.